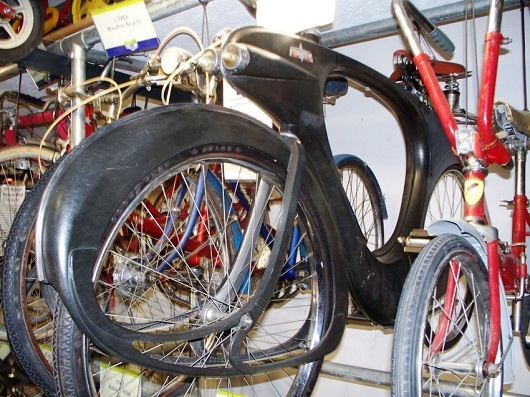 What does a Scott Flying Squirrel and a 1935 Flying Flea aeroplane have in common? Chris and I recently spent a few days in the Lake District; we got lucky with the weather as it only rained on us for one morning. 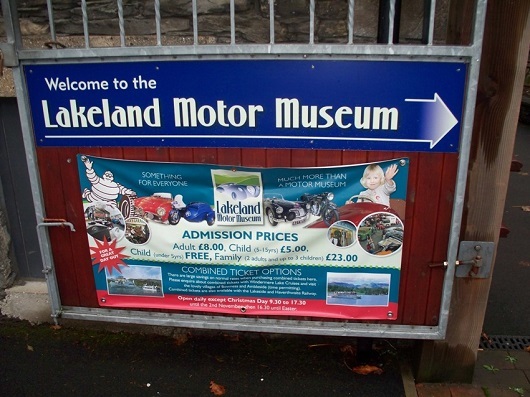 Whilst there I decided to check out the Lakeland Motor Museum. 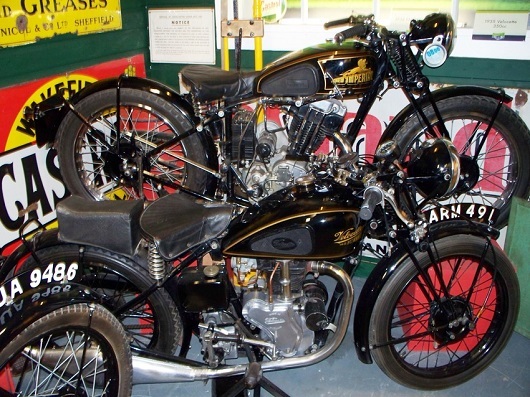 I first saw this collection many years ago, when it was at Holker Hall; the collection was relocated to a modern building close to Newby Bridge in Cumbria in May 2010. Talking to one of the members of staff I was told that the new building is better heated than the previous one, which helps to keep the exhibits in a good condition. Approaching the museum there is a large car / bike park opposite – very useful in the Lake District in the height of the holiday season! There is plenty of space for club rides out to park up. The entrance is via the museum shop, where there is an excellent guide book for sale. 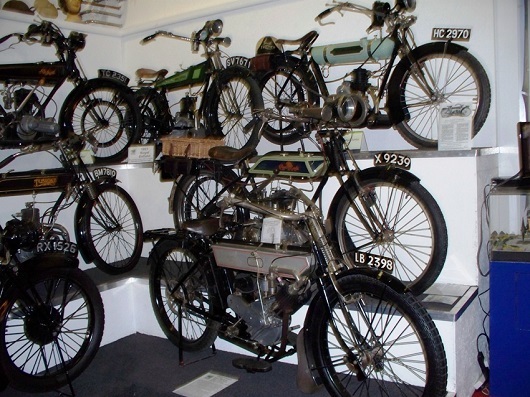 Entering the main hall, immediately on your right, is a group of motorcycles; these are displayed on three levels or platforms. 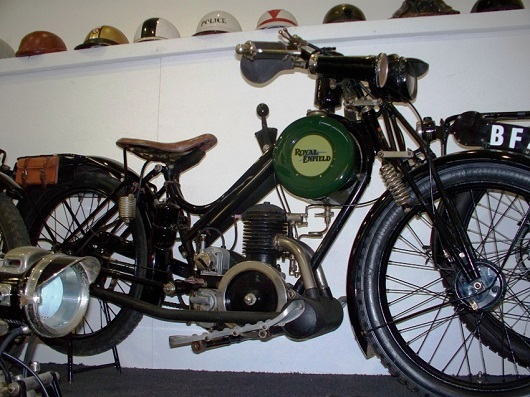 One of these was a Tussock – a 1919 model, with a 350 cc two-stroke engine with direct belt drive to the back wheel; however there was no gearbox. 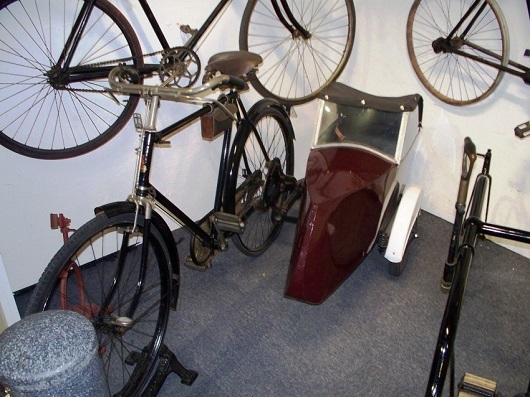 On the same stand I also spotted a 1909 Phelon and Moore with an engine size of 465 cc and two gears; this had a sloping engine in the same style as my later Panther Model 100. 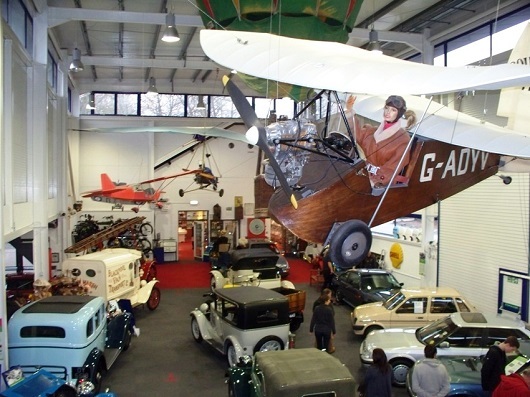 The main hall also had a few aeroplanes hanging from the ceiling and a nice collection of motorcars on display. 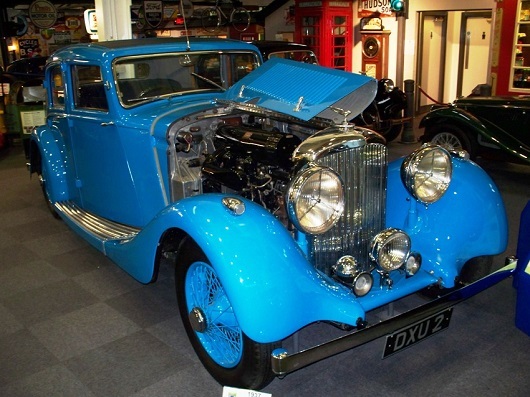 One of the cars, a Bentley, was painted in Bluebird Blue and it was owned and driven by Donald Campbell, a local hero and world record holder. In 1935 his record breaking car attained a speed of just over 300 mph, more than 5 miles per minute. There were several DVD displays scattered around the place, giving you an insight into the area that you were in. 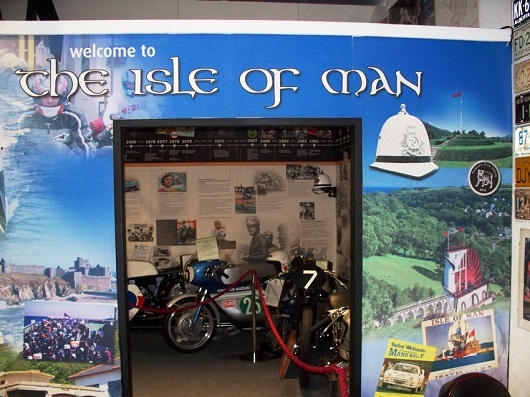 One of these upstairs was a show about the TT races, with several racing machines, old and newer, on display and a special tribute to John McGuiness. 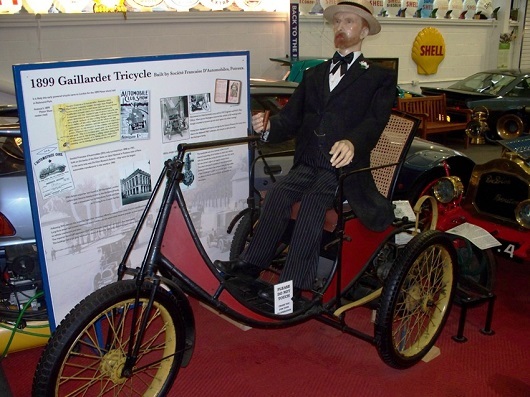 Several period dummy shop windows re-created on the ground floor had interesting exhibits. I could look at them and remember seeing these things years ago. 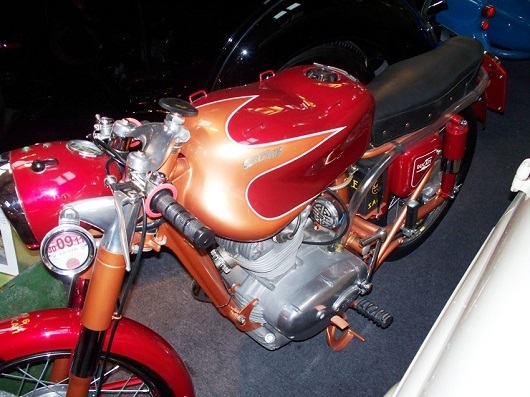 There are a lot of motorcycles, scooters and mopeds on display here, and most are in good condition; however some are “as found”. In the scooter section there was a BSA / Sunbeam scooter with a notice saying that this machine is their next restoration project. 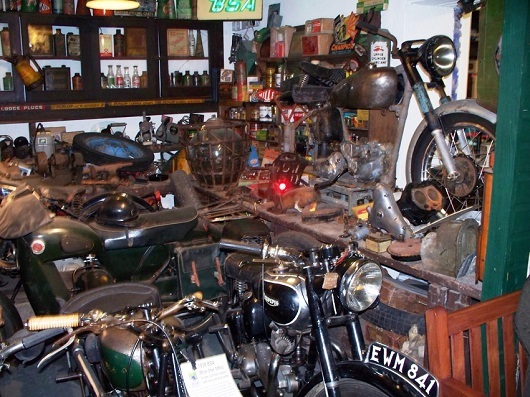 In this section there were also some mopeds and autocycles. 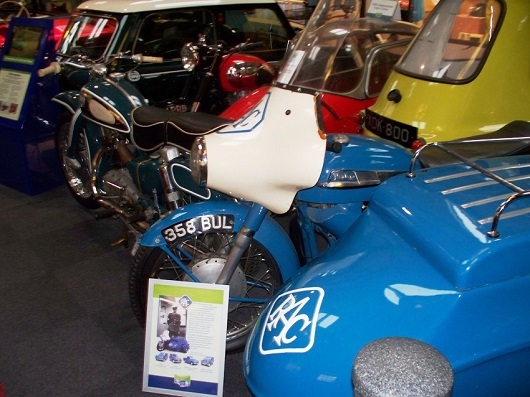 A couple of these caught my eye, in particular a Heinkel Perle, which was quite modern-looking for its day, and also a Benelli Motorella, which I have not seen before. 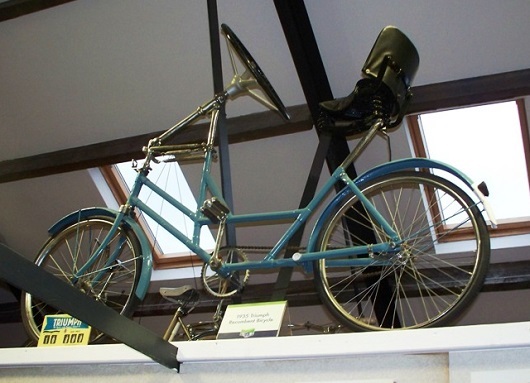 Together with all the bicycles on display this museum is a haven for people interested in two-wheeled transport. 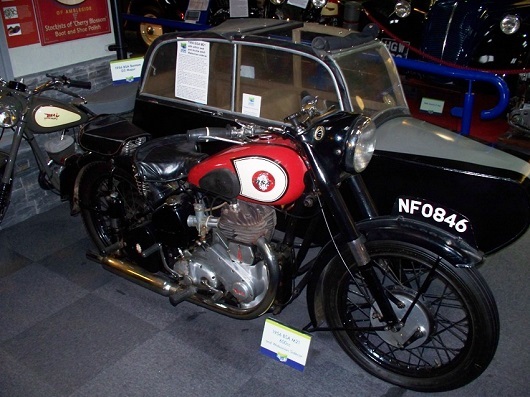 Hanging from the main hall ceiling was a 1935 Flying Flea aeroplane; this was quite small and it was powered by a Scott Flying Squirrel motorcycle engine; there is also a Scott engine on display. 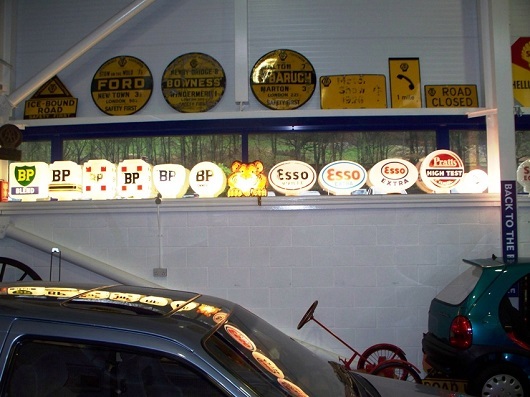 The museum has a large collection of automobilia, including petrol pumps and globes, clothing, pedal cars, models, toys and games. All under the one roof are the exhibits and displays, the gift shop and a café with riverside seating over looking the River Leven. In the courtyard there is a period caravan on display that you can go in. As it says in the guidebook this is “much more than a museum”, and I agree that it is. 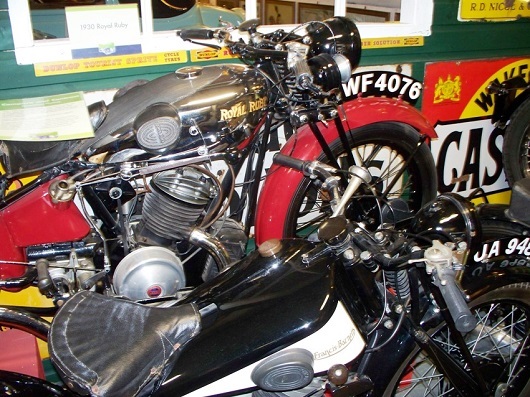 It is well worth a visit, and whilst in the area a ride to the Hardknott and Wrynose Passes would make for a nice exciting ride, as in places there are some very steep sections – as much as one in four.